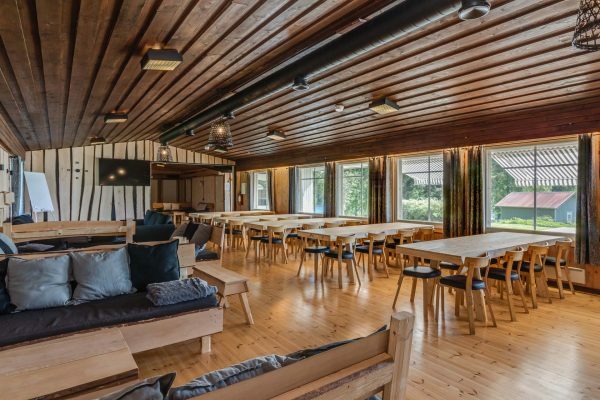 Aulanko Grand Villa is located in Aulanko Peace Area next to the lake Aulangonjärvi and suits well for over 100-person daytime events. The multifunctional villa is especially great for 10–40-person accommodation and meetings. The spacious building boldly presents the rough but atmospheric craftsmanship of the local carpenters in its decorations. The windows give a view over the Aulanko’s lake scenery with the nationally famous granite observation tower rising in the horizon. These landscapes inspired even Jean Sibelius himself. 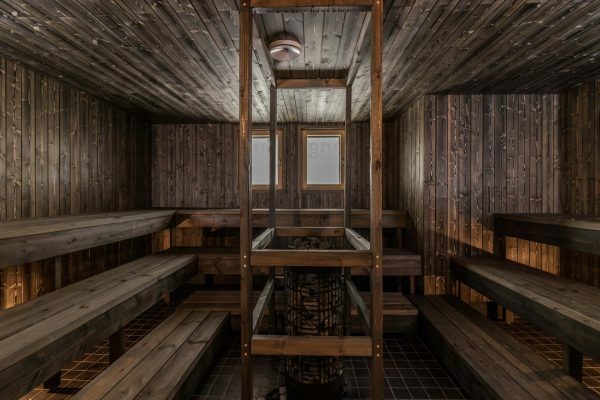 The Grand Villa’s sauna facilities with a large sauna oozing with the wilderness atmosphere and 2 changing rooms are a cherry on top for relaxed and restful socializing! Aulanko Grand Villa has been renovated from the ground up in 2017 and has a total area of 350 m2 which is rented for a single group at a time. The 150 m2 main hall can easily be rearranged for the customer’s needs from small meetings to 100-person parties. 9 bedrooms and extra beds give a total of 35 to 50 bed places. The multifunction villa has a 70 m2 sauna facility, a separate sauna, 2 outdoor terraces and 2 atmospheric designated campfires. Also, a large kitchen is available since cooking amongst friends is a great way to spend time. As a speciality the building has a game room where our customers can enjoy their time by playing games such as Finnish darts and table hockey. View detailed floor plan. The main hall of 150 m2 offers space for around up to 100 persons around long movable dining tables and sofa sets. The space can also be used for accommodation purposes due to the sofa sets. The free Wi-Fi works swiftly, and the large flat screens can be used as TVs or presentations screens. The main hall has direct access to the large terrace that can also be accessed from Grand Villa’s large sauna. The terrace presents a breath-taking view over the lake Aulangonjärvi with the observation tower standing tall above the forest. Accommodation: Aulanko Grand Villa´s 8–10 bed rooms and sofa sets offer bed places for up to 35 persons. We can also offer extra mattresses for even larger groups. 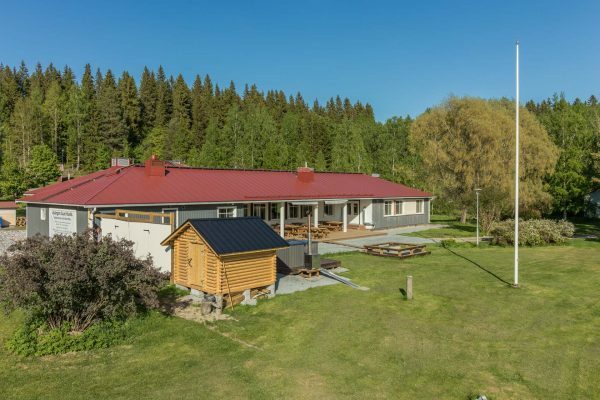 In case you have a group of around 100 persons we are happy to rent the whole Aulanko Peace area for you with a total of over 100 bed places! Kitchen: Tableware for up to 50 persons, an electric stove, a big fridge, a freezer, a dishwasher, a microwave, multiple Moccamasters, electric kettles and toasters. Our customers are free to prepare food themselves, however, we will gladly offer food services if desired. 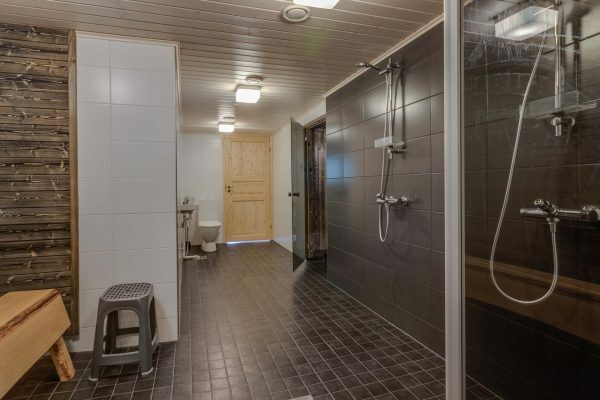 Sauna, Shower and Bathroom Facilities: The spacious sauna comfortably sits up to 20 persons. There are 2 showers and a direct access to the large terrace to cool-off or jump in the hot tub. 2 dressing rooms are especially great with bigger groups making the process of getting in and out of sauna a lot smoother. Thanks to 4 bathrooms, also morning and evening routines need less organizing. Hot Tubs: There are 2 hot tubs each on their own terrace. One is next to the main building and the other is next to the separate sauna building. Both hot tubs can be accessed via a terrace keeping feet clean any time of year. 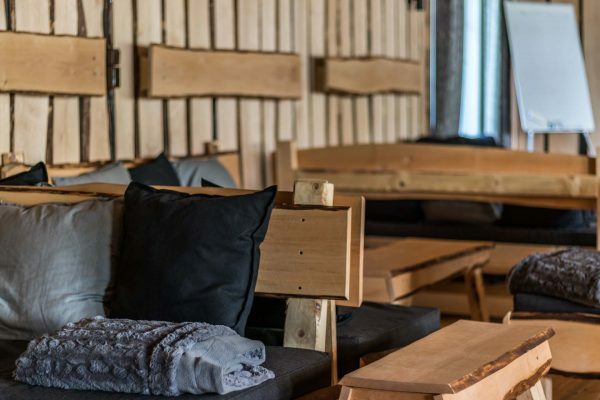 Lakeside Sauna: Right next to the shoreline is a traditional sauna that sits 15 persons and is also equipped with modern comforts. 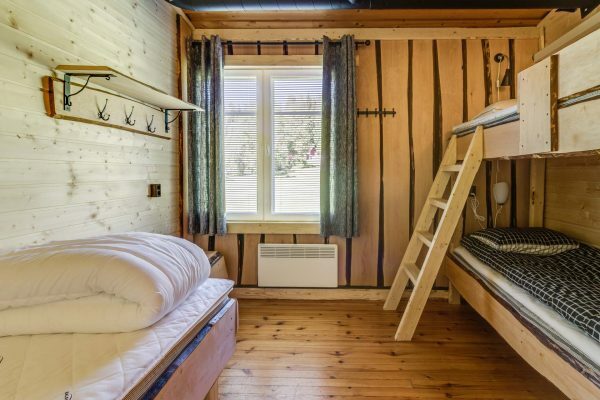 There are 2 dressing rooms, a 10-person steam room, and a separate bathroom and shower. The steam room has a direct view over lake Aulangonjärvi. Game room: Aulanko Grand Villa has a game room for fun competitions. The 80 m2 room has many games including pool, air hockey, table tennis, table soccer, table hockey, darts and Finnish darts. Don’t worry if you miss a dart or two, the robust wooden walls won’t even flinch. Barbecue: In the yard area there is a open fireplace for barbecue. In addition, there is a robust charcoal grill (we kindly ask to bring an own charcoals for it). 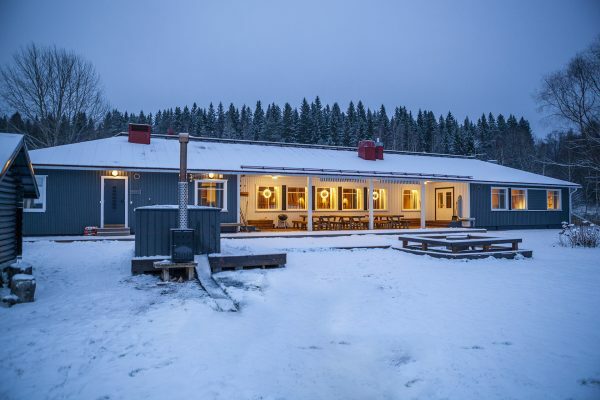 Fishing, Boating and Paddling: Aulanko Grand Villa is located only 50 meters from the shoreline making it effortless to go fishing, boating or paddling on the peaceful lake Aulangonjärvi. Who knows, with some luck you might end up roasting some self-caught fish! And during winter you can go ice fishing, cross-country skiing and ice skating. We will gladly organize guidance in fishing, so please ask if you are interested. Hiking trail: Near Aulanko Peace area there is an outdoor route where you can take a small hike during low or no-snow season. A route map can be borrowed from the main building. The magnificent Sibelius Forest is also just a few hundred meters away! Pricing: Our price is tailored for the customer and the final price depends on group size, time frame and length of stay. Here are only some pricing examples. We reserve the right to change our pricing. The price includes the air-conditioned 350 m2 multifunction villa. Additional services offer the use of the hot tubs, the separate lakeside sauna, the final clean-up, towels and sheets with the bed made or sheets as a stack. 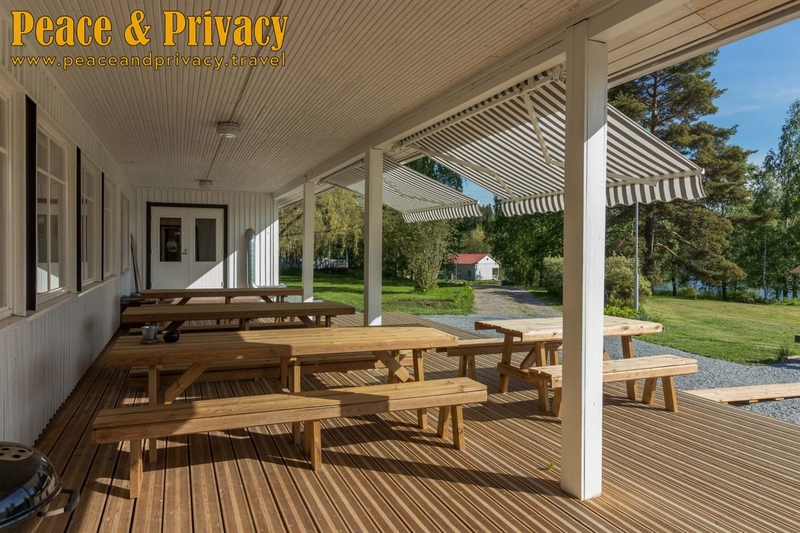 Ask for an offer for Aulanko Grand Villa by filling the offer request or by contacting us via email info@peaceandprivacy.fi.